NEW YORK (CNS) — A 17-foot-tall cross-shaped steel beam that was found in the wreckage two days after 9/11 became an indelible image in the months following the terrorist attacks on New York in 2001. That cross is to be displayed as a historical artifact in a permanent exhibit in the National September 11 Memorial & Museum, scheduled to open in May near the site of the former World Trade Center. But a group called American Atheists has sued in federal court to have the cross taken out of the exhibit and replaced with a plaque that would say “atheists died here, too,” according to a Religion News Service story. American Atheists Inc. first sued the museum and the Port Authority of New York and New Jersey in 2011, arguing that displaying the cross would offend them as citizens and taxpayers and was a violation of the First Amendment’s Establishment Clause. 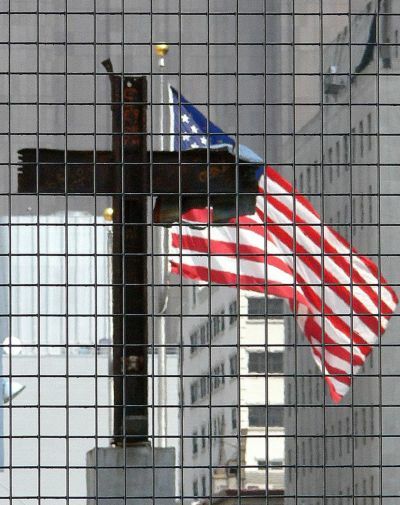 A federal District Court judge ruled in favor of the cross, saying that “it helps tell the 9/11 story.” In August 2013, the American Atheists then filed an appeal with the U.S. Court of Appeals for the 2nd Circuit. Oral arguments were heard in the case March 6. Arguing for the American Atheists, attorney Edwin Kagan said that calling the crossed beams a religious symbol only gives one story of the people who suffered in the attacks and has no place on government-owned land. The museum, a private foundation, is leasing land in lower Manhattan owned by the Port Authority of New York and New Jersey. The Becket Fund for Religious Liberty filed a friend-of-the-court brief in the case Feb. 7. As a historical artifact, “the cross rightfully belongs in a historical museum,” the organization said in a statement. It added that the American Atheists had no right to sue in the first place. “Taking personal offense over the role that religion actually plays in American life is not grounds for bringing a lawsuit,” the Becket Fund said. A decision in the case is not expected for months. A news release from the museum said the cross will be part of an exhibit called “Finding Meaning at Ground Zero,” which will portray how rescue workers at ground zero struggled to deal with their harrowing circumstances. In 2006, at a memorial service in New York to mark the fifth anniversary of 9/11, a Catholic construction worker in attendance from Allentown, Pa., told Catholic News Service that when he first saw the cross-shaped beam, his hair stood on end. Across the country in Southern California, another atheist group, the American Humanist Association based in Washington, successfully fought against a cross that was put at the side of a highway as a memorial to a 19-year-old boy who was struck and killed by a car as he was crossing a street near the highway in 2012. His family placed the cross in his memory shortly after his death, but removed it March 6 after the atheist group, on behalf of a local resident, pressured the city of Lake Elsinore, Calif., to take it away. News stories said after the dead teen’s family removed the large white cross, smaller crosses appeared in its place, left there by other residents who disagreed with the actions of the American Humanist Association.